4 What Kind of Cheese Is a Low Melting Cheese? Most cheeses are developed using a slow bacterial process. Ricotta cheese is produced using a combination of heat and acid. This technique is applied to the milk fat leftover from mozzarella production. The result is a soft and shapeless cheese somewhat similar to cottage cheese in texture but completely different in taste. Ricotta cheese flavors a wide variety of recipes thanks to its unique structural properties -- and the fact that it will not melt. The acid used to produce ricotta cheese renders the proteins within the cheese resistant to heat. Milk proteins that have been treated with acid form much stronger bonds than those formed through aging. Instead of blending with moisture and breaking down into a smooth melted goo, ricotta remains rigid in structure with solid protein and little resulting moisture when heated. 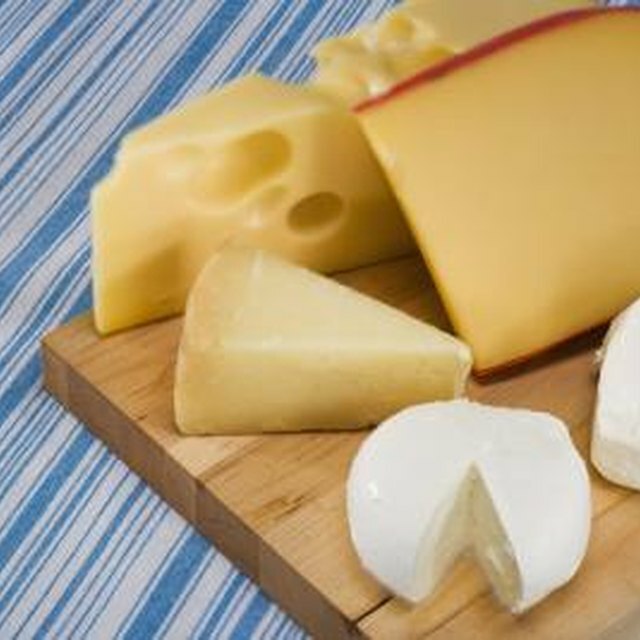 Other cheeses that exhibit these non-melting properties include queso blanco and halloumi. The fact that ricotta cannot be melted is precisely why it is useful in so many dishes. A soft cheese that holds its consistency without becoming stringy or soft is ideal for recipes such as baked ziti, pizza, lasagna and Italian cheesecake. Ricotta is also ideal for stuffing because it is soft and pliable but not runny. Ravioli, cannoli and manicotti benefit from the features of ricotta. Cooking with ricotta requires that you apply heat without burning the cheese. While other cheeses will melt and soften in high heat, ricotta will brown and smolder when it comes in contact with an open flame. Ricotta is best when served cold, or baked and allowed to warm through slowly. A generous dose of olive oil can help to reduce the chances of burning and increase the softness of the cheese when warm. Apply it after a dish has been cooked and left to absorb the ambient heat for a few moments prior to serving. Ricotta that contains added salt is called ricotta salata. It is placed under pressure and aged for at least two months before resulting in an entirely new cheese. Ricotta salata is firmer with far less moisture and a texture that is more similar to feta than cottage cheese. Ricotta salata is, of course, saltier than standard ricotta and delivers a much stronger taste. Thanks to its consistency, ricotta salata will soften somewhat when heated but will not melt completely. Ricotta salata is not used in traditional ricotta dishes like lasagne or ravioli. Use it as an ingredient in warm dishes that combine pasta with vegetables and cheese, in cold salads and atop rustic Tuscan-style pizzas.